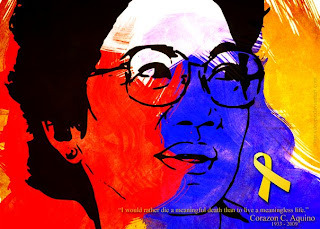 Yesterday, Former Philippine President Corazon Aquino was finally laid to rest at the Manila Memorial Park. It was a very historic event for every Filipino like me. Although I wasn't born yet when Pres. 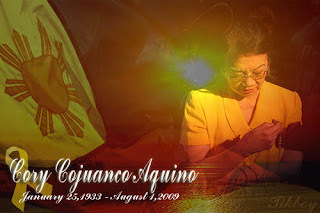 Cory Aquino led the Philippines, my parents told us stories on how great she was not only as a leader but as a Filipino as well. She is known as the "Mother of Democracy" because she brought back peace and freedom to every Filipino after Marcos announced martial law. Flower petals and confettis fell from the sky, ships sounded mournful horns, and thousands of people soak in rain brave the 22.8 kilometer route from the Manila Cathedral to the Manila Memorail Park in Paranaque. Everyone was in yellow shirts shouting Cory! Cory! Cory! and doing the "laban" sign. 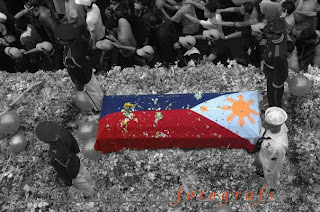 Filipinos really find it hard to say goodbye to the Philippine's first woman President. Pres. Cory, we will truly miss you!